We haven't heard from Switzerland's Kirk in better than a decade. After a successful debut album in 2003 and some touring, the band took a hiatus after their original drummer took ill. The other members pursued new projects in the interim. But as of 2010 the band has reformed, began writing, and then recording with uber-producer Dennis Ward to create Masquerade. This is solid melodic heavy metal, possibly a touch on the power and progressive metal side. You'll get the former with the aptly titled Supersonic Speed, the latter with Devil's Claw or Masquerade, by example. But some might say that these songs or something like Time and Face in the Crowd are a mash up of both. Fundamentally, what's rather impressive is the depth of song composition and musicianship. Every song sounds really good, and different, with a truckload of catchy melodies and strong vocal harmonies. Thomi Rauch is easily becoming one of my favorite metal vocalists. But the rest are no slouches either, pulling together and pulling off some terrific sounds. When all these elements come together the result is rather dramatic and entertaining. Notable are The End of the Universe and Eternity where the smooth melody, catchy hook in chorus, soaring vocal arrangement, and crisp guitar leads of each song is quite inspiring, and simply a delight to listen to. 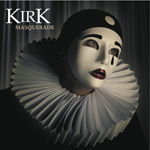 Masquerade is a strong return to form for Kirk; frankly, I don't think there's a single dull song in the bunch. Here's hoping they stick around to give us more in the future. Quite recommended. Masquerade is a strong return to form for Kirk: melodic heavy power metal in it's best form lead by some really terrific vocals from Thomi Rauch.